Artists, photographers, theoretical teachers and advisors of several art centers, with numerous international individual and collective exhibitions. Their activity has focused on the conservation, recovery, exhibition and direction of artistic collections. They have been working for the University of Navarra since the beginning of the 90s in the management of the Photographic archive that is part of the Museo Universidad de Navarra. They are currently the artistic direction of Museo Universidad de Navarra. Daniel Canogar (Madrid, 1964) received a Master's Degree in Photography from New York University and the International Center for Photography in 1990. He has produced a variety of works in different public spaces, including Waves, a permanent installation in the atrium at the Houston Center in Houston; Travesías, created for the atrium of the Council of the European Union in Brussels; and Constelaciones, the largest photographic mosaic in Europe, which can be found in Madrid's Rio Park. His most recent projects include Storming Times Square, a video intervention involving 47 of the screens in Times Square. His works have been exhibited at the Reina Sofia Museum and Vélazquez Palace in Madrid, Bitforms Gallery and the American Museum of Natural History in New York, and the Andy Warhol Museum and the Mattress Factory Museum un Pittsburgh, among other venues. 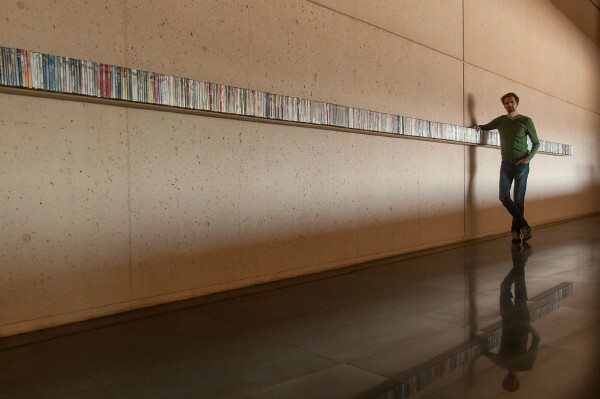 Daniel Canogar presents a sculptural video-installation made up of 2,400 recycled DVDs. This multi-thematic piece is inspired by the "sikka", the gold coins that in Babylonian times were sewn on clothes and that turned into bright plastic objects, known today as sequins. A surface that evokes wealth and power, just as DVDs remind us of the glamour of Hollywood, where the image has become a bargaining chip. In the installation, the DVDS’ content is projected onto its surface, granting new uses to waste materials combining the phantasmagorical properties of the cinema with its hardware. The self-generated soundtrack that accompanies it is the resulting "accidental composition" created by overlaping the soundtracks of the actual segments that are being projected. The final effect is that of an audiovisual mosaic. In this way, the installation of Canogar reflects about our culture, the hardware we use to store information and the survival of these in today's society. Once the exhibition time was over, the piece traveled to Madrid, as a loan to Sala Alcalá 31, an exhibition space of public ownership dependent on the Community of Madrid. The piece was created specifically for the Museum of University of Navarre. Therefore, the Museum decided to bet on the exhibition so that it became part of its patrimony and it could stay where it arose. A micro-donation campaign was created: € 100 for the purchase of each of the 2,400 DVDs, among campus students and museum visitors. The buyer received a personal work of the artist and an official certificate from the Curatorial Department of the Museum, in which it certified the exact DVD that was contributed to the Museum's funds. The amount could be collected in a year and the Museum was able to acquire the work at the Max Estrella gallery. You can check the campaing's site here.